Gadacz, René R.. "Clan (Indigenous Peoples in Canada)". The Canadian Encyclopedia, 12 April 2019, Historica Canada. https://www.thecanadianencyclopedia.ca/en/article/clan. Accessed 20 April 2019. Clan has been used to designate social groups whose members trace descent from either male or female ancestors. For the Indigenous people in Canada, the term has been used most often to designate groups based on unilineal descent. This means that a person belongs to the clan of either parent. Clan has been used to designate social groups whose members trace descent from either male or female ancestors. 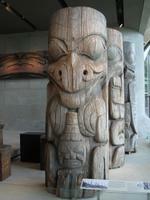 For the Indigenous people in Canada, the term has been used most often to designate groups based on unilineal descent. This means that a person belongs to the clan of either parent. Examples of matrilineal societies, those tracing descent from a female, are the Haudenosaunee, Haida and Tsimshian. Clans, named after birds, fish or deer, were important in regulating marriage (usually to forbid marriage with a fellow clan member). Certain rights, privileges and property were also associated with clans, and they functioned as ceremonial units that cut across geographical and even linguistic divisions.